The flying boats were designed because there were originally very few long runways that could handle a large airliner. The flying boat overcame this handicap neatly with ready made water runways available all over the world. The great flying boats occupy a permanent place in the annals of transport aviation history. Present-day accounts by passengers who once flew on these aircraft speak of them with great affection and nostalgia. In spaciousness and comfort, they offered a means of air transportation as outmoded today as the luxury railway trains and steamships of the distant past. After World War Two (1939 - 1945) many long range landplanes existed as surplus bombers and transports. In addition, countries all over the world had built long concrete runways for the military. 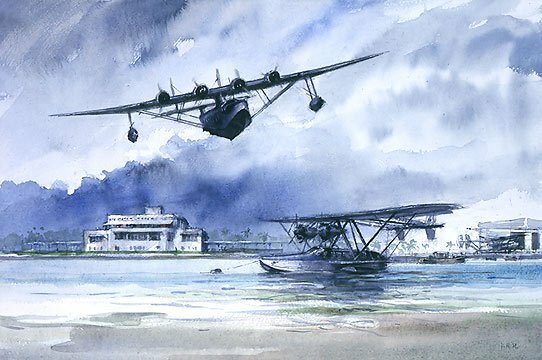 The proliferation of long runways and long range land planes signaled the end of the great flying boat era. When hostiles ended, it was natural that the airlines should restart the services interrupted by the war. The airlines purchased surplus DC-3s, DC-4s and DC-6s that were no longer needed by the United States Military. Most post-war domestic airlines restarted with the Douglas C-47 (DC-3) Dakota. The long haul over-ocean airlines (Pan American, TWA, BOAC and KLM) purchased the C-54 Skymaster (DC-4 and DC-6 aircraft).